PRE-PRINT, ADVANCE SPECIAL OFFER Hitler's War. David Irving's standard work on Adolf Hitler based on documents exclusively available to him and thirty years of research and interviews with Hitler's generals and private staff. Jacketed hardback, with new picture section. Cheaper than Amazon! and eBay! 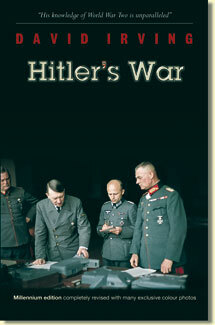 PRE-PRINT, ADVANCE SPECIAL OFFER Hitler's War. David Irving's standard work on Adolf Hitler based on documents exclusively available to him, and thirty years of research including interviews with Hitler's surviving colleagues, generals, and private staff. Delivery before Christmas. Jacketed hardback, with new bigger picture section. It has not been banned anywhere desspite furious attempts by Mr Irving's opponents. Cheaper than Amazon! and eBay!